They say that the fear of public speaking is the number 1 fear people have, even topping the fear of death! What you need to remember is that your audience needs you. You are important to your audience because you can change their lives. 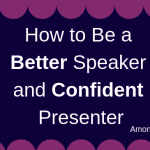 Don’t think of your presentations as you being a speaking rock star for praise and applause. Think of you being the rock your audiences leans on most. You are the speaking rock star because of how much of a difference you are making in people’s lives. Here are some things you can do to get over your fear of public speaking, calm your presentation nerves and feel good before you have to speak in public. When we are feeling the fear of public speaking coming up, we tend to breathe shallow because we are nervous. When you breathe from just your throat and upper chest, you are cutting off your air supply and increase your feelings of fear and anxiety. 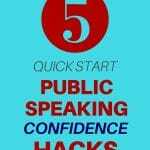 An easy solution to overcome the fear of public speaking is to take deep belly breaths. You will quickly feeling calm, relaxed and at ease. Drink room temperature water because it will keep your vocal cords open and keeps your mouth from drying out. If you drink cold water, it tightens your vocal cords and will make it harder for you to breathe. Therefore, less breathe equals an increase in nervous and anxiety. Imagine you have a presentation coming up and you are feeling all this discomfort in your physical body. Take a deep breath and breathe out all your worry and fear through your mouth. Exhale big and release it again. Repeat the process until you feel calm and relaxed. Breathing out is a simple, effective and easy approach to get over your fear of public speaking. And you can use it anytime you need it! 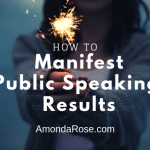 Watch How I Overcame My Fear of Public Speaking – You Can Do It Too! Discover how I overcame my fears in one of my very popular YouTube videos. Calming your physical body before presenting is super important. There also very practical speaking steps you can take to help you feel at ease. One of the best ways to do that is by getting to know your audience, so they can get to know you. Here are some essential steps you can take before presenting that will make you feel good and ensure you shine as a speaker. Arrive before your audience does because it gives you time to relax and check out your surroundings. Be there to greet the audience as they are coming in, chat with them and find out why they came. Let the audience see that you genuinely care about them. Show interest in the audience before, during and after your presentation. Show the audience that you are genuine, friendly and approachable. Talk to them and, be yourself. Take note of stories, questions, and comments that the audience has so that you can incorporate it into your presentation. Most people love when you truly listen to them and include them in your presentations. If it was a private conversation or someone is super shy, it might be best to leave them out of your presentation. The more you interact with your audience, the more relaxed you will become. The audience will see you as a friend and a speaker. Be yourself, be authentic and let your true self-shine through! Trust me they will love you! 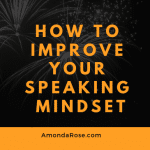 I have put together the blog posts below as your step-by-step speaker tools and presentation tips to help you succeed. Keep on reading! Are You Ready to Become the Speaker, Motivational Speaker, or Public Speaker Who Captures His or Her Audience and Converts Them to Bookings and Business Leads? Click HERE to start your speaker success!